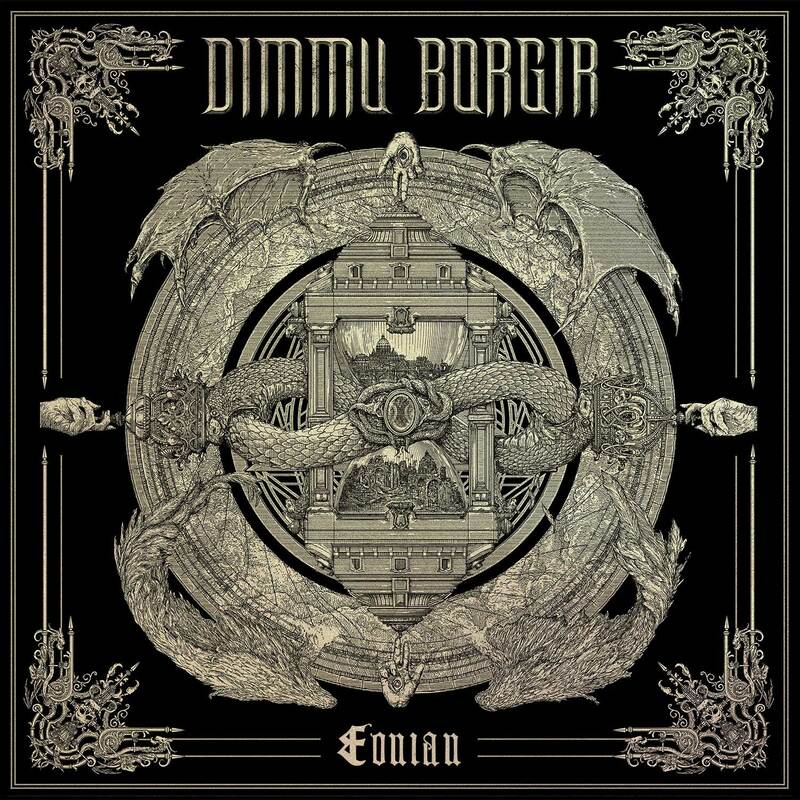 One of the most anticipated releases this season for many Metal fans is the new album, Eonian, by Dimmu Borgir, to be released this upcoming Friday, May 4th, 2018. Regardless of whether folks stand in the band’s camp or opposed, this album is sure to elicit strong feelings. Eonian is the band’s first release of original material since 2010’s Abrahadabra. In the words of singer, Shagrath, this album “marks the 25th anniversary of Dimmu and the album itself is a tribute to our own history and the Norwegian Black Metal history.” Abrahadabra put Dimmu Borgir in the position of being the first Norwegian band to break the US Top 50 since A-Ha. Fans are certainly wondering, though, if the new album will contain the heavy, ominous and pensive atmosphere of “Stormblåst” or the headbanging riffs of “Mourning Palace.” Read on. “The Unveiling” is the first track on Eonian, arriving with a dramatic introduction via keyboards and Black Metal-styled tremolo picking which shifts into a slower riff offset by choral parts. The main riff of the song has a flanger or phaser effect on the guitar giving it a swirling sound that marries well with the tremolo style of picking. One simply cannot deny the resemblance in sound to material on Covenant‘s Nexus Polaris album (a side project of former members of Dimmu Borgir). The verse section features up-front bass with low, narrated-like vocals not far off from those perpetuated by the perennial rival, Dani Filth of Cradle of Filth. When the chorus introduces a gargantuan choir with orchestral parts, it, unfortunately, sounds like an entirely different band. The ninth track, “Alpha Aeon Omega,” begins with foreboding strings which graduate to a beautiful melodic line which is then doubled by the guitar with blast beats. The verse section features a variation on the tremolo picking which graduates to a melodic interlude. Just when things were starting to feel like classic Dimmu Borgir, though, the massive, homogenous, over-used choir returns to kill the mood. Though the band does return to the heavier section, it’s hard to embrace that original mood after it was so bombastically shattered. On a more positive side, the fourth track, “Council of Wolves and Snakes,” breathes classic Dimmu Borgir. While it is perhaps the most varied track on the album with an experimental arrangement and orchestration, the Black Metal riff they throw down brought the first smile to my face. The seventh track, “I Am Sovereign,” echoes some of their earlier material with its twisted, carnival-sounding keyboard parts and headbanging riffs locked in with the double bass. The most memorable and impressive track on the album is the last, “Rite of Passage.” Starting with the sound of pouring rain, clean guitars strum the initial melody which then gets beefed up with distorted guitar chords and harmonies. The track is a major success because not only does it offer an absorbing, unique atmosphere, but it also shows that the band can still compose memorable melodic songs without relying on the choir. It is a very guitar-driven song, and surely most fans would embrace this direction. It would be nice to see them turn down that path indeed. Eonian seems to be a disjointed affair overall with many points of contention. First, there is the issue of the bass. In none of the press materials I’ve seen could I find the credit for either who recorded the bass parts in the studio or who will perform them live. The presence and tone of the bass on Eonian is pretty good, yet who is it? When I.C.S. Vortex (Simen Hestnæs) joined the band, he provided them with the advantages of not only having an extremely talented bass player, but also one with totally unique and powerful clean vocals. That being said, it’s difficult to really embrace the band when their best element is gone. The only members listed on the Nuclear Blast site are Shagrath (vocals), Silenoz (guitar), and Galder (guitar). Gaute Storeas evidently helped with the choral arrangements for the Schola Cantrum Choir, and I can only wonder: why if the choir is so integral to the band’s current sound/direction, are they not proper members? Listening to most of the album, it sounds as if the choir are just as legitimately featured as Shagrath, who is almost completely monotone and devoid of the individuality or charisma of a singer such as Abbath. Also, where are the riffs? Heavy Metal in general, let alone Black Metal or Extreme Metal, is completely dominated by the guitar, yet this album has the choir drowning out everything else! The guitar has to be at least louder than this. When all is said and done Dimmu Borgir have enjoyed massive success despite being an extremely polarizing band. The band does come from legitimate roots, even for purists, with their take on Symphonic Black Metal. It’s been quite a while since Dimmu Borgir could be considered Black Metal, though. Regardless which side one chooses in the debate over their legitimacy, the band have succeeded in recording and producing an album with a huge sound, an intended consequence of their original, tenebrous take on the Scandinavian scene. Perhaps what all fans of Extreme Metal can agree to is that Dimmu Borgir, at the worst, could be a gateway drug of sorts to lead burgeoning fans to more stygian selections such as Watain, Leviathan, or Mgla. What would be intriguing, though, would be to hear Dimmu Borgir at their best.